Holiday Shopping at Kohl’s + $100 Giveaway! I participated in an Ambassador Program on behalf of Influence Central for Kohl‘s. I received promotional items as a “thank you” for my participation. What do Disney and Kohl’s have in common? Well if you have been reading my previous articles you would know the answer to this question. In the past Kohl’s has teamed up with Disney with a fabulous clothing line featuring your kids favorite Disney characters. Few months ago, Kohl’s Department stores in partnership with Disney announced a national call for the Sing Your “Frozen” Heart Out contest. “Frozen” fans submitted videos of themselves, their kids, and/or the entire family singing “Let it Go” for the chance to appear in a Kohl’s holiday commercial that would air during the 2014 American Music Awards (AMAs) broadcast. And now if you watched the AMAs last Sunday, the winner has been chosen! Out of nearly 4,000 “Frozen” fans submitted the videos to the “Frozen” Sing your heart out contest, America voted Long Island Sisters Katherine & Kelly Montenero as the winners. Their perfomance was featured in the Kohl’s holiday commercial during the AMAs last Sunday. Just in time for the holidays, visit Disney.com/FrozenFriday presented by Kohl’s to see the winning video and the Kohl’s holiday commercial. I actually loved my shopping experience. Wednesday evening around 6 pm, just before Thanksgiving, Black Friday and hot deals, was probably the best time I have ever shopped at Kohl’s. My local store was not very crowded, very clean and nicely organized with deals and promotions they were putting for Black Friday. It is always good to take advantage of their 15 or 20% coupons they are sending me. To be honest with you, I only shop at Kohl’s with the coupon that they send me in the mail 🙂 Don’t you? My daughter and I had a blast. She is growing to be smart shopper just like me. I first go to the 60 or 70% discount rack for kids. There we dig through ton of “stuff” but usually can dig out few nice and needed pieces out of the discount rack. Because my 8 y.o. went shopping with me, she expected that I would buy something for her. She needs new set of pants and long sleeve shirts for the winter. I told her I would buy something for her is the stuff is under $20 dollars, otherwise she would ask for many things. We happen to hang by the kids section discount rack and we found some cute outfits on clearance for $6.80, $7.20 and $5.60. All 3 outfits she loved so much, she loved scanning the prices at the price check and came back to me running “OMG this is only $6.80! and so on” She was so happy with her picks, then she said, “Mama, lets get out of here, we’re done shopping”. This is my daughter’s outfits that she picked and a great Thanksgiving pic at my mother in law’s. My mother in law was complementing so much on her new looks. 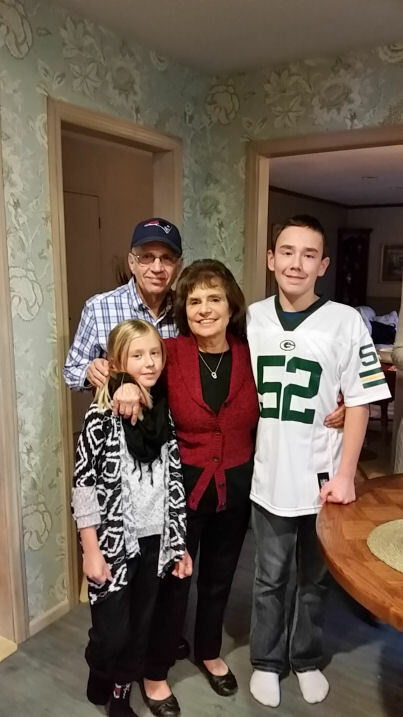 I have no idea why but my NYC Kohl’s happen to have the Greenbay Packers jersey for $11 which team my 12 y.o son happen to fan:) My holiday shopping at Kohl’s turned out great! 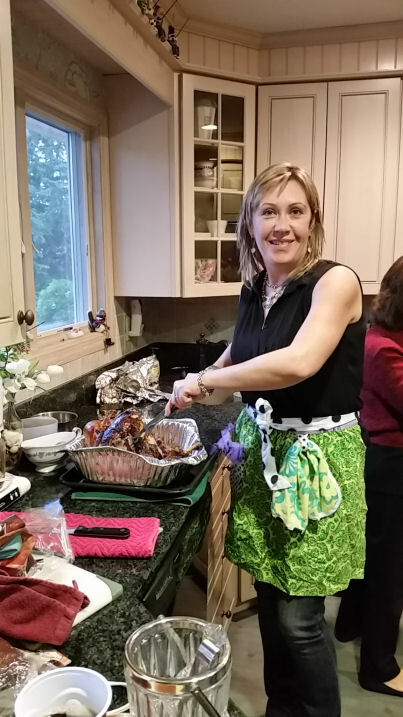 And this is me and my 15th Annual Turkey carving. Love my annual job. Happy Thanksgiving everyone and happy and safe holidays to come! 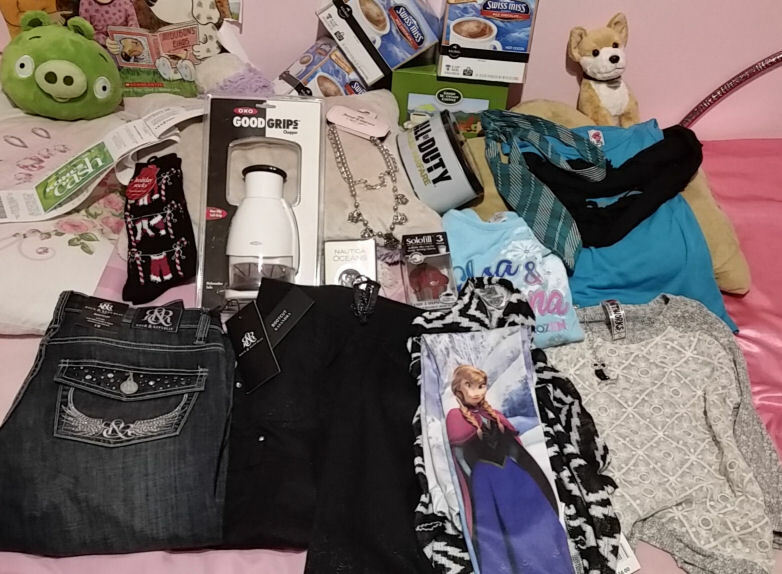 Now let’s go to the even funner part – Because Kohl’s is sponsoring my post, they are also providing a $100 Kohl’s Gift card to 1 very lucky I Love My Kids Blog reader! Who’s excited? Can I get a Woot Woot!? Thank you for this opportunity!!! This would be amazing to win!!! I would get the LC Lauren Conrad Fit & Flare Organza Dress. 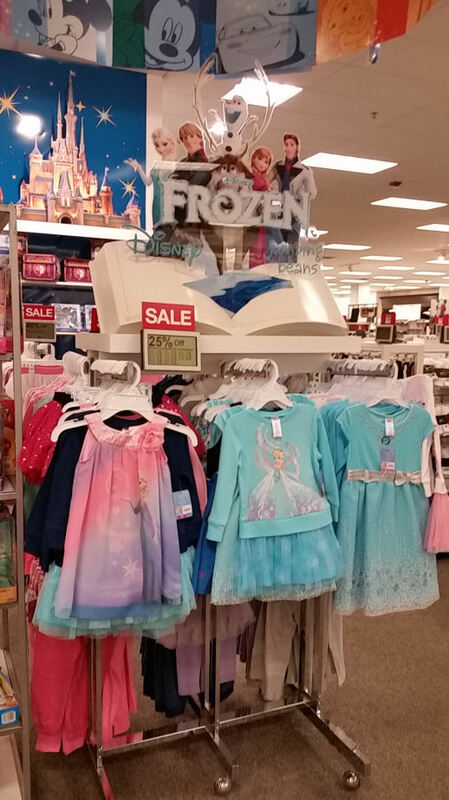 If I win, I may purchase the Disney Frozen Elsa Musical Light-Up Dress for my niece. jeans, shirts and a LOT more!! I would love to purchase a new pair of boots or a coat. I would buy some clothes for my sister as part of her Christmas gift. Clothes for my niece and my daughter. For my mom, I would purchase her the Nostalgia Electrics Old-Fashioned Kettle Popcorn Maker. She LOVES popcorn and needs a new popper. This would be fun for her! I would love to purchase some new boots. I would get some nike workout pants. I want to buy some sweaters! I would love to get the Olaf waffle maker and some clothes for my nephew. I would get my daughter Maybelle the Frozen 12′ bike! She would be so stoked! I would buy some new clothes for a new job. I’d like to get my daughter the Crayola digital light-designer spinning light canvas! I would use this gift certificate for Christmas shopping. I’d be buying toys and clothes for my kiddos for Christmas! I could really use some new shoes for walking on the treadmill! I would purchase a new outfit for myself. I would be buying some jeans for my girls to wear they grow so fast! Something for the house , a Tv ,or bike. I would use it on the woman, juniors and petite clothing clearance racks!! some cool, new, kitchen appliance like a very nice blender or mixer. I would use it to get my son some winter clothes. I’m looking forward to purchasing the Disney Frozen Olaf Pajama Set – Toddler and Disney Frozen Olaf “Is It Cool Out Here Or Is It Just Me?” Tee – Boys 4-7 for my grandsons! 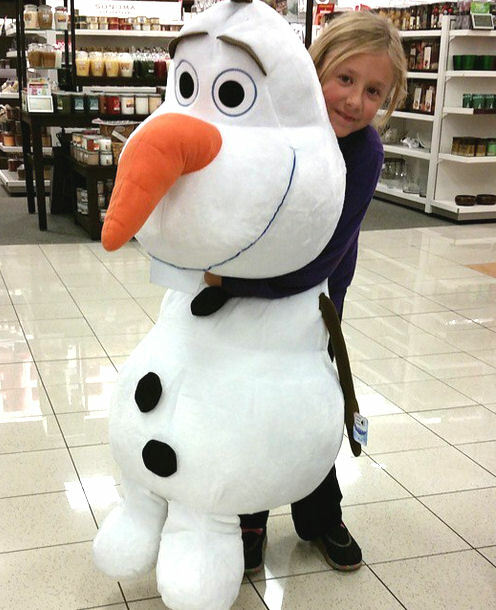 I would most look forward to purchasing some clothes for my 9 year old but I would have to throw the little splurge in there and get her an Olaf doll since she wants one so bad. (not that gigantic one though–she needs clothes much more). I would buy a Keurig because I have always wanted one! I would buy a few things for my Grand Kids! I would love to buy my son more winter clothes. If I’d won, I’d purchase clothes for my family and I. I love the quality of Kohls cloths. They also have some great kids designs in the kids clothing. Not sure of what else I would purchase if I am lucky enough to win the kohls gift card but I am going to purchase the discovery fort for my 3yr for sure. I really need some work clothes so that is what I would buy. I would buy Christmas gifts for my daughter. I happy that Kohl’s has Frozen items for teens/adults; she is 18 but loves Frozen! I’d also buy her some winter boots. Anything Frozen my daughter would love! What I’m looking forward to purchasing from Kohl’s if I win this giveaway is a KitchenAid food processor attachment. I would love to buy a few extra toys so that we could bless some families at a local hospital. I’d also like to get a new pair of shoes for my youngest. Maybe a new purse or credit card holder, and some pants for me. Gifts for my grandsons, and family! I’m looking forward to be able to buy something for my granddaughters for Christmas. Most likely something from the Frozen collection. I would love to get new sheets and a bedding set. Boots for me! My you pick em gift! LOL! I would by myself new clothes. I recently lost some weight and I don’t have many clothing items that fit me. So much to pick! Def. gifts for my family. I most likely would purchase clothes with the gift card. I love that Kohl’s has petite sizes. I’m only 5′ tall and it’s hard for me to find clothes that fit my height. My entire wardrobe is entirely clothes from Kohl’s! New clothes for me! I’ve recently lost 50 pounds and none of my clothes fit! If I won, I would buy some new school clothes for my children. I would love to buy clothing for my grandchildren. They just had their 4th child! I’d like Carter’s pajamas for my daughter. I’ll get Disney Frozen Olaf Waffle Maker . A lot of Frozen items. I am looking forward to purchasing some new clothes! I would love to purchase a Keurig for myself! I have several jewelry gifts on my Christmas shopping list so the Kohl’s giftcard would be perfect. I love their jewelry. Bedding for the kids rooms. I am looking forward to shopping in the small kitchen appliances department. I really would like to have an electric griddle or skillet and also a nice, rice cooker. Both those things, I think, would make my life much easier. Frozen nightgown for my niece. New tops for the whole family. I would get clothes for my children. Definitely will stock up on kids clothes, including some Frozen items. I need a duvet cover and I also need maternity clothes. Cool . I love giveaways. I hope I win!!!! Hi, I would love to buy some gifts for the giving tree!! to donate!! I did 99% of my Christmas shopping online at Kohls.com this weekend! !, love, love, all the deals and Disney items! and kohls cash back!!! I would get the Chaps Surplice Knot-Front Dress in deep currant and some Christmas presents for my family. Oh! I would so love to buy clothes! I’d get the Elsa & Anna Fleece-Lined Leggings and the Elsa Snowflake Sparkle Dress. If I won I would give this to one of my sons so he could pick out something he needs. I would love to get my 13 year old son some new clothes! I always seem to be buying clothes and toys for his younger sister(little kids are easier to buy for!) I would like for him to be able to pick out what he wants! I would purchase some kids clothes, new Sunday shoes for the boys, some new pillows, and a couple of Bamboo Smelling Candles. I would love to buy my newest grandson some awesome clothes from kohls- he is due to arrive in December. I need some new warm winter boots. I would get some boots like the LAMO sporty suede ones, need a pair as winter is here. we would get a new keurig since ours is on it’s last leg. totally broken. I want to purchase Christmas table linens. I would love to pick up some new pajamas for my kiddos! i am looking forward to buying my mom some nice jewelry for Christmas. I am looking forward to buying lots of Vera Wang and Lauren Conrad tops from kohls. I would get my 4 year old some clothes and some Christmas decor. Or there is a set of Corelle dishes sold exclusively through Kohl’s that I really like to have. I would get my 4 year old some clothes and some Christmas decor. Or there is a set of Corelle dishes sold exclusively through Kohl’s that I would really like to have. I would like to get something nice for my grandkids! I would love to purchase clothes for my family with this. I could use a new pair of winter boots or a jacket. I look forward to buying new clothes with this gift card. Oh I would love to get him the Disney Olaf Ice Friends Comforter – Twin/Full!! Oh he would be so excited to have that on his bed at night! He is in love with Olaf! Looking forward to buying some new clothes because I really need some. I would love to get the Disney Frozen Crystal Kingdom Vanity Set. I live in their Croft & Barrow knit shirts. I am looking forward to getting some new clothes. I love the clothing line at Kohl’s!! I am looking forward to purchasing items from the Disney Olaf Ice Friends Bedding Collection. love khols love to shop there for my daughter. I would use the Kohl’s card for some major shopping! I would get some new curtains for my mom. I would buy christmas gifts for my kids if I won it! I would buy a christmas tree for sure! I would buy my husband something nice for xmas with this. He always goes out of his way to make sure the kids get a great xmas and deserves more himself. When my kids were little, they’d get socks and underwear for Christmas, so there would be just that little extra to open up. Now that they’re adults, they expect it! I’d use the GC to help with that purchase this year. If I won I would love to use the giftcard to get some new pots and pans, mine are SO worn out lol! I could use a new purse and some socks! I look forward to buying Frozen pajamas. I’d love to have a new coat. I’d get some shirts for my husband, and long pants for me. I would buy clothes on sale for my youngest son Travis who is 19, almost 20..he desperately NEEDS clothes!! I have two nephews and a niece who would love some clothes from Kohl’s. I would buy Christmas Gifts for my husband. I really really really REALLY want to put up curtains in my living room. I would get the curtain rods for them. Pretty ones. I love the Elle and Lauren Conrad brand clothes at Kohls. They are cute clothes that don’t make me look frumpy. I would purchase new towels and a shower curtain. I need a new purse, if I won the giveaway I would get the Stone & Co. Leather Irene Hobo in brown for myself and use the rest for gifts. I love shopping at Kohl’s.I could use some jeans and I would use the rest for clothes for my grandson. If I won the giveaway, I would buy some jeans or a purse! hi, i would probably use it for x-mas gifts, but if i was to spend on myself, i love the ‘vera wang’ clothing & accessories. With 4 kids there’s always someone who needs something! Clothes would be at the top of my shopping list! I would use it toward a new comforter set for our bedroom. Thank you for the chance if I won I would buy my son some clothes! I would love a new Keurig and some clothes. I would buy christmas gifts If I won!! I would buy clothes for all of my kids. I would purchase some living room decor as a christmas gift to my self! I’d like some sweaters for winter. My kids need clothes. That’s what I would buy. I would like to buy some new curtains ans a new sweater. I would purchase new pjs for my new twin grandbabies. I want to give the card to my daughter. She shops at Kohl’s all the time and will use it in no time! Plus…I think I messed up on the facebook share,,,I don’t know from URLs and pinning, etc. Hope t went through. I need some shorts and shirts for our daughter. Would get my children Christmas outfits. I love their plus size section and they have J-Lo shirts which are like $48 bucks which is sorta expensive so I would probably get two nice shirts or one and some jewelry! Awesome !! The kids I work with at a local school love anything Frozen ! I will donate to the school if I win. Thanks ! I would buy the Disney Frozen World of Creativity Kit for my daughter. I would purchase gifts for my nieces and nephews. Would love to buy clothes for myself! I am hoping to score that giant olaf for my grand-daughter who always say I have no bones to me. If I won this giveaway, I’d buy a new mattress pad for my bed. Some new towels for my bathroom! I am looking forward to purchasing some toys for my grandsons for Christmas if I get it before Christmas. I need new bedding for the season…flannel sheet set, blanket, comforter. Thanks for the giveaway & the chance to win! I would get an electric blanket!!! it is cold here. I want to purchase some new cookware. I’m looking forward to getting the Disney Frozen Elsa Musical Light-Up Dress for my daughter! 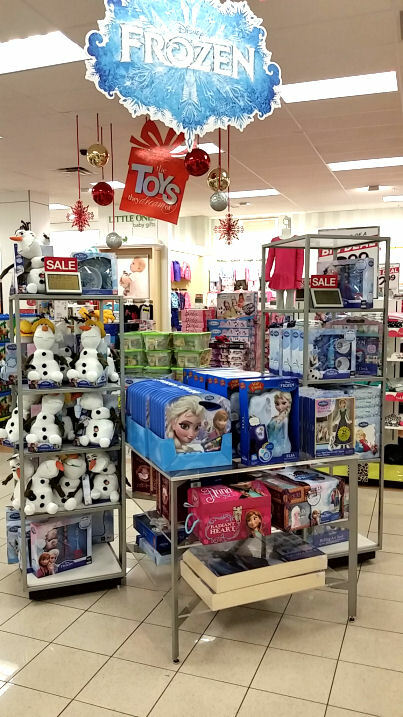 I’m excited to buy my daughter Frozen toys for christmas! I would use the money to buy some small appliances. I would like to purchase a new winter coat! I’d like to put this toward the Sauder Carson Forge Collection Dresser. I am looking foward to purchasing my son some new clothes. If I won, I might buy this dinnerware set: Gibson Everyday Eventide 46-pc. Dinnerware Set. Id buy the Olaf bath wrap or the Elsa light up dress for my grandkids. I am looking to buy some jeans for my daughter and some pretty sweaters. I would purchase things from the home goods department. I would like to buy new pants for myself. love this blog and learned some new info yep! One thing I would love to get from Kohls would be the Wall Hanging Jewelry Organizer. I would get a new comforter set. My granddaughters would each love to have the Disney Frozen Springtime Silk Touch Plush Throw. I would like to buy some girls Frozen PJ/s! A 4 pc set of dishes that go with my current set. My toaster oven (which I got at Kohl’s years ago) is on its last legs and I would be very happy to be able to replace it if I were to be the lucky winner of this giveaway. And at Kohl’s prices, I’d probably be able to pick up some Christmas gifts, too! I might gift it or get a smart blu-ray player or …. so many choices!!! I want to get my daughter the cool Frozen snow boots and some other Frozen gear! Kohl’s has the best selection! New boots and some good K cups! I would buy more shoes for my son. He outgrows them so fast! I am looking forward in buying my daughter clothes for Christmas. I would love to buy some warm clothes for the kids maybe some jackets! I’m looking forward to getting some new cloths for my son! I want to buy a comforter and towels if I win $100 Kohl’s Card! I would by new boots and an outfit for Christmas. If I were to win, I believe I would buy the Disney Frozen Fold-Out Sofa for my grand daughter. If I won this contest, I would purchase clothing for the 3 grandchildren I have custody of. They are now 10, 13 and 14 yrs. old. They are growing by the day and it is difficult to keep them in clothing. Thank you for the chance! P.S. enjoyed the blog and the pics. I love that Kohls carries some talls….so, new tall PJ’s for me! I would purchase some new clothes for myself. I always focus on my son and boyfriend, so I think it’s time to get myself something. I would buy some work shirts for my boyfriend. Maybe some fancy towels and definitely a new shirt or two for my mom!! I would get my kids Christmas gifts. I would get my girls each a dress if I happened to be the winner. Tysm for the chance and Merry Christmas! Toys and clothes for my 4 kids! I could buy so much at Kohl’s with $100! Toaster…between waffles and toast for daily breakfasts, ours is on its last leg. Thank you so much. Sent an email. This is such a blessing.